Friction continues in Jewish Home as Uri Ariel says constitution should be formulated only after his National Union party is merged. 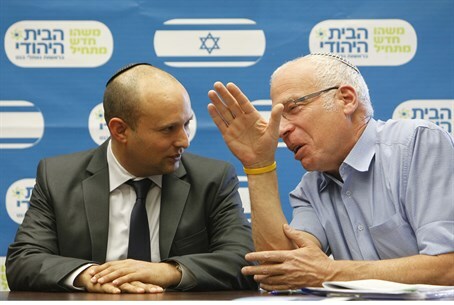 Housing and Construction Minister Uri Ariel spoke to Arutz Sheva on Monday about the debate within the Jewish Home party over a new party constitution, critics of which claim will give party chairman Naftali Bennett almost "absolute power" over the party. Ariel began by noting that he himself is a member of the National Union party which unified its list with the Jewish Home party, formerly the Mafdal or National Religious Party in the last elections, and not a member of Jewish Home itself. However, he noted that the new constitution is likely to have an impact on his National Union party given that the party is in the process of discussing unification with Jewish Home. The minister commented that he would have expected that before the party constitution was passed, the process of unifying the parties, which was discussed immediately after the elections, should be completed. The decision to put the constitution before the unification is a "serious mishap," which "they're doing without us and asking us to join onto," stated Ariel. The new party constitution in its current form would allow Bennett to fill every fifth spot on the party's Knesset list with an external candidate based on his own discretion. Also, every candidate for the list would have to undergo a qualification period of thirty months' (2.5 years) membership in the party before running for the Knesset. The period could be shortened - but again only at the party chairman's discretion. Another point of contention in the law is that all party placement for executive positions in the Knesset, including positions such as minister, deputy minister and committee chairman, would be selected by the chairman with the approval of the party's central committee, and not be selected by the central committee directly as has been done in the past. "Confronting us with facts on the ground"
"We are ready to advance the merging process at all times," said Ariel, arguing that given the absence of upcoming Knesset elections there is no need for a "political blitz" determining such a rushed law. When asked whether Jewish Home might not be trying to formulate a basic constitution that National Union could later change, Ariel said such a process was not likely at all, since there's no way that a new constitution could be passed "every two months" in accordance with the changing nature of the party. "This is disordered work," assessed Ariel, suggesting that Jewish Home advance unification with the different members of its Knesset list, and then pass a new constitution, "and not confront us with facts on the ground." According to the minister, he had discussed the issue with Bennett and other senior members of Jewish Home, but his words did not fall on attentive ears. Ariel reminded that he suggested after the elections to hold daily meetings and sit for roughly two hours until the process of merging the parties was completed - up till now, he notes that only one meeting on the issue has been held. "It's natural that a chairman wants to fortify his position, but how much and how exactly is up for discussion," said Ariel. Stopping the Gaza rocket fire with "a firm hand"
Speaking about the escalation of rocket fire from Gaza, Ariel stated "the Hamas organization was defined in Israel and the world as a terror organization - read enemy of the state of Israel - and you treat an enemy as an enemy." "The government needs to make a stand behind a clear statement and to order the proper ranks to act with a firm hand," remarked the minister. Discussing comments that suggest an expanding operation in Gaza, Ariel remarked "I won't go into the question of a ground entry (to Gaza). I appreciate that most of the work can be conducted from the sea and air, but if needed, then also by ground." If the world doesn't recognize an IDF presence in Gaza, Ariel remarked it wasn't a big problem, as the world doesn't recognize many things, such as Israel's presence in eastern Jerusalem and the Golan Heights. While Ariel praised the liquidation of a terrorist on Sunday in an IAF airstrike on a terror cell planning a rocket attack, he added that there have been strikes on old, abandoned targets which should be ceased. "The IDF and the ISA (Israel Security Agency) have the capability, and it should be utilized in high dosages. Enough of the short-lived words. When there's an enemy, you fight it," remarked the minister. Discussing the three Israeli teens who were abducted by Hamas terrorists on June 12, Ariel was asked if the situation might spin out of control into a long term abduction given the apparent lack of clear information. "We need to take that possibility into account too," said Ariel, adding that not everything is in our hands and there is a danger of "the matter extending." Nevertheless, Ariel emphasized that security forces are going "above and beyond" to return the kidnapped teens, praising the high motivation.